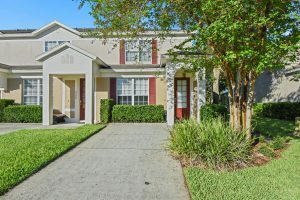 Absolutely stunning 3 bed/3 bath, executively furnished, end unit pool home in the much sought after Windsor Palms Resort, Kissimmee. This exceptional home is being sold fully furnished and equipped as seen and offers accommodation comprising: 3 ensuite bedrooms; Queen bedroom on the 1st floor with an ensuite shower room which can also be accessed from the hallway; the gorgeous King master suite & beautiful ‘Mickey’ themed twin room are on the 2nd floor along with laundry facilities. The fully equipped kitchen is open plan to the comfortable living & dining area. Sliding doors lead to the screened SW facing splash pool & brick paved deck area – perfect for sunbathing, relaxation and enjoying our lovely Florida sunsets. The home has no rear neighbours and enjoys open wooded views. Ideally located for the theme parks, restaurants and shopping, this guard gated resort features a beautiful clubhouse, Olympic size salt water pool, spa, 58 seat cinema, tennis courts, basketball, volleyball, playground, fitness centre, sundry shop, tiki bar and more….